On December 11, 1789, the General Assembly passed a bill chartering a state-supported university. The idea was not a new one. North Carolina’s Constitution of 1776 directed the establishment of “one or more universities” to be supported by state funds so that education could be provided to citizens at affordable rate. Due to the Revolutionary War and the financial burdens that the state incurred as a result, the legislature was reluctant to approve a bill for a university. 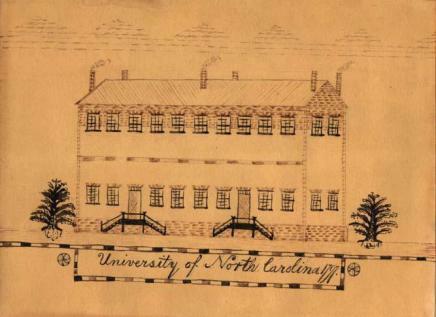 It was largely through the efforts of William R. Davie of Halifax that the University of North Carolina was chartered by the legislature in 1789. A site in rural Orange County was selected for the university in late 1792. A group of Orange County farmers previously had donated funds and a parcel of 1,290 acres of land atop New Hope Chapel Hill, an area named for the Church of England chapel that stood there. The University’s first building, now known as Old East, served as both dormitory and classroom. It opened on January 15, 1795 and the first student, Hinton James, arrived from New Hanover County on February 12.